Comments Off on Arkansas. Wine. After years of telling me that they were going to retire to Arkansas, my parents have finally done so. Kevin and I tried to talk them into moving to Oregon, but they weren’t going for it. So, Arkansas it is. In the middle of the Walmartian capitol. Luckily, like almost every place in the country, there is wine nearby. Yup. wine. Located in three American Viticultural Areas. Twenty-four wineries. California it is not. But that isn’t a bad thing. After all, variety is the spice of life. So what’s the deal with Arkansas wine? Officially, viticulture began in Arkansas in the 1870s when German and Swiss immigrants settled in Altus, Arkansas. Unofficially, there was wine in Arkansas before that. In A Journal of Travels into the Arkansa Territory During the Year 1819 With Occasional Observation on the Manners of the Aborigines by Thomas Nuttall, F.L.S. (I have no idea what F.L.S. means), the author describes the vineyards and wine encountered along the way. Tales of wine being produced at local taverns like the Hinderliter Grog Shop in Little Rock circa 1827 are likely to be true. And prior to American settlement? Well, Arkansas was once officially part of France after all. In addition to the Altus wineries, Italian immigrants have made their mark in Arkansas’s wine history. The city of Tontitown was founded by the followers of Father Pietro Bandini in 1898. The residents, mostly from northern Italy brought their traditions with them including wine making. Even today, the sign welcoming you to town features grape vines. Unfortunately, for most American’s the town is more commonly known as the home as the Duggar family. What kinds of wines are being produced? Well, a lot of sweet wines. Muscadine grapes grow naturally in the state and have long been used to produce. Muscadine is a type of grape known as Vitis rotundifolia that is native to the United States. But Muscadine doesn’t have to produce a sweet wine and there are dry options as well. Map produced by Gretchen Neuman using a USGS basemap. Other grapes producing wine in Arkansas include Niagara, Concord and Delaware which are park of the Vitis labrusca family. French-American Hybrids such as Chambourcin and Vidal are common as is Cynthiana, a Norton clone is thought to be created in the Arkansas. There are even folks producing Chardonnay and Merlot… though most of them get that fruit from California. There are three viticultural areas in the Arkansas. Altus is located around the German Swiss town of the same name in the Boston Mountains. Altus is the only appellation found completely within the state. Altus is also located within the Arkansas Mountain appellation but extends in the area from Fort Smith to Conway (another place my folks thought about moving to… but thought better of as the town is dry). Ozark Mountain contains the Altus and Arkansas Mountain regions and is crosses into Missouri and Oklahoma as well. Getting your hands on Arkansas wine is tricky. The state does not play well with others, i.e. does not allow direct shipping and because of that can’t ship out of state either. So you kinda have to go there and taste it there. But since I am about to be spending more time in the Ozarks, I guess I will have time to explore. Just like the great river for which it is named, the Ohio River Valley AVA has changed its course. I alluded to this over the weekend when I mentioned the new Indiana Uplands AVA. But because I wanted to focus on Indiana Uplands and the also new Elkton AVAs, I didn’t get to the revisions the Ohio River Valley. And the new? Well, I assumed that the variation between the two maps would represent the original map minus the territory that would have crossed over into the new Indiana Uplands AVA. So, I am including both maps here so you can judge for yourself. I feel fairly satisfied that I guessed correctly. Now, what the variations are and what they mean? That will be discussed on another day. If you are interested in new American Viticultural Areas, then this has been the week for you as the TTB created two new wine regions and amended a third. Indiana Uplands is located in the Hoosier State along the Ohio River. Unlike the old Ohio River Valley AVA, this new region extends further north to Bloomington. The next new appellation is in Oregon. The Elkton AVA is located within the currently existing Southern Oregon and Umpqua Valley regions. The area is located near the confluence of the Umpqua River and Elkton Creek. As for the amended Ohio River Valley AVA, well, I haven’t gotten around to figure out what has changed, but am guessing that the Indiana Uplands portion of that map is out. But that is just a guess. You will have to check back sometime next week to find out for certain as well as to find out why these new appellations were designated. There is more to my neighbor to the north besides cheese and the Green Bay Packers. I have had several nice experiences in the Dairy State and am pleased to learn that an application has been filed for a new appellation. By CJ Moss via Wikipedia under a Creative Commons Attribution-Share Alike 3.0 license. 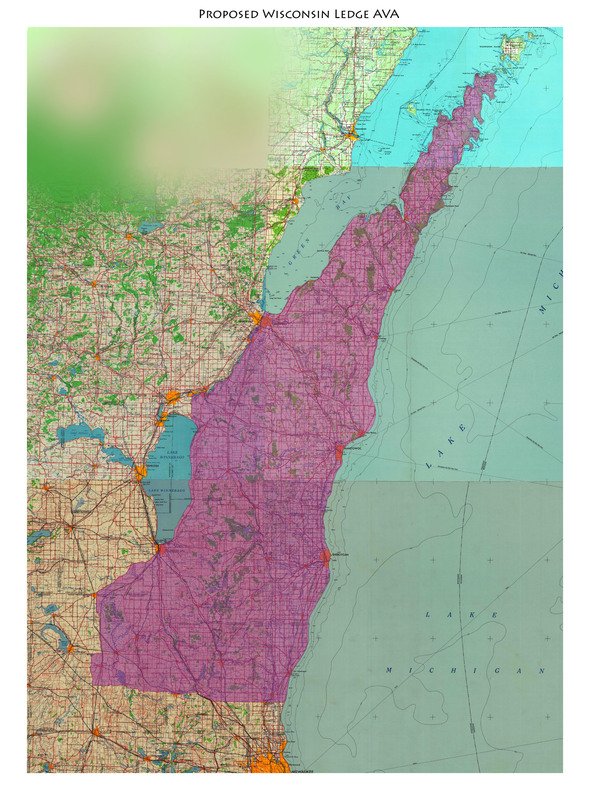 Called Wisconsin Ledge, this potential AVA consists of the western most part of the Niagara Escarpment as it reappears out of Lake Michigan. The application points out the regions underlying rocks of dolomite (Lockport Dolomite) which provide minerals as well as drainage to the areas soils and are overlain with sand, loam and glacial moraines. If this sounds vaguely familiar, it is because it exceptionally close to the geography of the Niagara Escarpment AVA in western New York State. In the case of the New York appellation, the climate is moderated by two Great Lakes (Erie and Ontario) and the prevailing west wind that would blow across them. The Wisconsin Ledge has a more moderate temperature due to its proximity to Lake Michigan but the west winds would be more continental. The new potential AVA is located in the Door Peninsula, south of the Fox River, east of Lake Winnebago and north of County Highway T (North of Milwaukee). This area is already home to at least twelve wineries including the Cedar Creek Winery in Cedarburg, Wisconsin. Map by Gretchen Neuman for VinoVerve.com under a Creative Commons Attribution-Share Alike 3.0 unported license. So three cheers to Wisconsin Ledge! It is about time that they got some wine with that cheese! Once I am on a mapping roll, I sometimes can’t stop. Here is the McMinnville AVA from Oregon and the Arroyo Grande Valley AVA from California. You might be wondering why I working on west coast appellations, but all will be revealed soon enough. After visiting Monticello, it makes perfect sense that my first stop the next day was the Jefferson Vineyards. The property was originally part of Monticello and granted to Filipo Mazzei so he could develop a vineyard. Jefferson had been disappointed by his attempts to produce wine grapes so he brought in Mazzei, a Venetian viticulturist to take over the effort. This is a story about timing being essential. Luckily, the dream lives on at this winery.